JPMorgan on Commodities: Right, Wrong or Early? I think JPMorgan would be foolish (or devious) to look past the glaring problem, i.e. things ARE different this time. Last time they made such an about-face with their view on commodities, the quantitative easing era was still in its infancy. Clearly that is not the case now. (While I don’t suspect the Fed is on its way out of markets just yet, the seed has been planted by Fed tapering rhetoric and the latest BIS annual report to suggest QE cannot actually go to infinity lest its benefits become risks.) Basically, expectations have changed enough to question the relevancy of their last overweight forecast. Gold down BIG ... as China is put on the hot seat! Click here to view this issue in PDF format. Commentators today are writing about one of two things: gold or China. I figure I’ll write about both. In fact, Jack and I have spilled a lot of ink on China in the last month or so ... right here in the pages of Currency Currents. The country’s rapidly expanding shadow banking system is rapidly garnering attention. It’s certainly something to worry about in the longer-term, as China’s Banking Regulatory Commission chief recently warned. But it’s not yet the type of development that’s going to break the back of the Chinese economy. 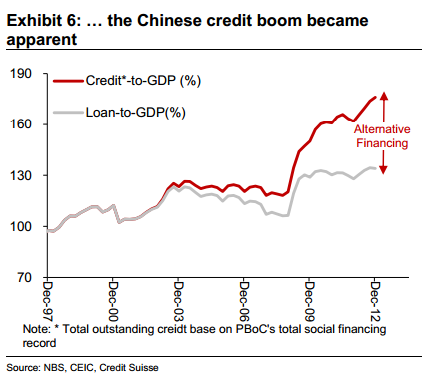 Actually, many Chinese officials are supportive of the growth in wealth management products and off-balance-sheet lending – these unconventional practices help to support growth at a time when official credit policies are somewhat restricted. Check out this video from Reuters for an idea of the dynamic playing out. Now lump on the fact that China’s first quarter GDP numbers were just reported. The 7.7% annual rate was a disappointment on expectations of 7.9%. Some other numbers are also factoring into investors’ nervous reaction to start the week. Surely, though, a 7.7% rate of growth is nothing to shake a stick at ... but China’s economy is supposed to have stabilized so that it may level off at a necessary and sufficient 8%. US and European Policymakers dream of a 7.7% print in their respective economies. But Chinese officials acknowledge that managing the economy (read: its citizens) becomes increasingly difficult the further a GDP number falls below 8%. It also becomes increasingly difficult as credit growth exceeds generally-accepted levels of sustainability. Financial leaders of the world's 20 biggest economies will consider next week in Washington a proposal to cut their public debt over the longer term to well below 90 percent of gross domestic product, a document prepared for the meeting showed. That number – 90 percent – I assume has some basis in the Reinhart, Reinhart and Rogoff analysis put forth in April 2012 regarding the sustainability of national debt levels. You can find some excellent analysis, done by Hoisington Investment Management Company in 2Q12, by clicking here. One final note on this: the International Monetary Fund, in recent issues of its World Economic Outlook and Global Financial Stability reports, remarks that rising debt-to-GDP poses a risk for respective emerging economies sooner, at lower levels, than it does for developing economies. Unofficial estimates put Chinese debt-to-GDP at levels in the neighborhood of problem countries in the Eurozone. Are we soon to see a point where taking on more debt doesn’t generate the economic growth China needs and in fact jeopardizes the economy? As of writing, gold has fallen more than $140 today (more than 9%) and is trading well below $1,400 an ounce. Popular gold analyst, Dennis Gartman, has said he’s “never seen anything like” what’s happening to gold right now (and he means it). I’ll wager the gold bugs will be out tomorrow with headlines containing two words: buying opportunity. We received some timely analysis from our friend Bob Brogan at Brogan Group Research on Friday that put a rough target on gold at $1,410. Well played! The research they put out is based on proprietary money flow oscillators and ATR bands ... among other things. A 100% Fibonacci extension put a third-wave downside target at $1,392, which has today been surpassed. An extension of 168% would take gold to about $1,150 an ounce. But I doubt it’s going to achieve that with the velocity of the last two days’ decline. In fact, I thought gold was due for a small corrective bounce about $150 ago! Now I definitely think it is due for a bounce. Jack warns buying here is the same diving underneath a falling knife ... or trying to break up a dog fight. He notes other support levels don’t come into play until $1,307 (swing-low chart support) and then $1,257 (138% Fib extension) ... and gold may just extend to those levels before a bounce happens. Tough to say ... but the faster the rush to call the end of the gold era, the sooner the bounce will happen regardless of whether the forecasts are correct. The era of central bank monetary accommodation expectations as market driver is over. Do central banks have anything left in the toolbox the people can’t ignore? I certainly don’t want to underestimate the potential central banks will concoct some sort of new and unprecedented strategy. Like I said of the BOJ above – I think policymakers (and politicians) have become desperate. Of course, if the influence of central banks has truly run its course, then the market may have the opportunity to take over. Is the gold price an indication the market is taking over? Gold prices do especially well during phases of low interest rates and high money printing. If the investing public believes the central banks’ stimulative policies are a) exhausted, b) ineffective, or c) both, then gold could lose its appeal for longer than many are likely to expect. Have these central bank purchases been aimed at propping up gold prices (and the status quo mentality) so that central banks may conceal their failure to truly reverse the deflationary forces still at work in global economies? China's debt-to-GDP is "unsustainable," say Nomura chief economist. The Wall Street Journal reports that China’s non-performing loans are nowhere to be found right now. But they suggest it's only a matter of time before non-performing loans surface and bite down on growth. China Banks Bad Loans Rise for Fifth Quarter as Economy Weakens. The shrinking loan profitability is not necessarily a huge concern. Recent policy changes have led these big banks to offer higher deposit rates so that they may compete for funds. That’s a good thing and is important for long-run rebalancing efforts. But the bad loans profile is discouraging. Capital Inflows Spur Premature Tightening Worries While the protracted period of capital outflows last year, due to deteriorating growth expectations, is not a good thing, renewed inflows may bring back a risk that Chinese officials have trouble maintaining China's growth stablization. With 1) the potential for Chinese inflation to increase in an environment of perpetual global monetary stimulus and renewed capital inflows, plus 2) the potential Cyrpus will spark a downshift in eurozone growth expectations and a crisis in confidence, China's financial system and debt could quickly become an issue that influences financial markets at a very inopportune time. Geopolitics and blowback from Cyprus - Can you say World War III? In our Global Investor monthly newsletter, back in November, 2012, we laid out the case for an end in the commodities super cycle. (See pages 4-8) The primary driver of this view is the idea the world is still mired in global deflation, despite the growing expectation of an inflationary spike at "any time." We are not denying the case for inflation, but believe it will take a lot more traction in the developed world economies before it materializes. That could be measured in years. The latest helicopter drop plans announced by Ben & Co., the explicit, yet conditional, bond-buying pronouncement from Super Mario of European Central Bank fame, and the news bank lending is on the rise again in China has triggered yet another round of financial market euphoria. Too bad the real economy; that place where most of the world works and lives and forages for sustenance, won't experience the same level of joy fund managers and traders-on the right side of this liquidity induced move-are now feeling. Might copper longs take a bath after the China news? "I believe there is something out there watching over us. Unfortunately, it's the government." Fundamentally, copper prices could fall. Technically, copper prices could rise. But either way, copper appears due for a big break. HONG KONG, March 27 (Reuters) - China holds more than 1 million tonnes of commercial stocks of refined copper cathode currently, a level last seen in 2009, due to high imports and weak domestic demand, which may slow arrivals in the second quarter, analysts said on Tuesday. High stocks may also prompt Chinese smelters to cut refined copper output, the analysts and sources at smelters added. 2) The Bollinger Bands bubbled out and now have narrowed rapidly, typically indicating a large and fast breakout (in either direction) is in order. Often, especially in the nearer-term, the fundamentals seem not to matter and price action is dictated by sentiment and technicals. If this holds, then copper could be on the verge of a substantial break to the upside. Today’s price action is not confirming that yet, as copper futures are down nearly 2% on the day. In addition to yesterday’s latest update on the copper supply situation in China, overnight earnings releases suggest Chinese companies are feeling the pressure from a slowing economy. That is influencing copper prices today. SHANGHAI, March 28 (Reuters) - China shares ended down 2.7 percent on Wednesday, the biggest one-day percentage drop in four months, as weak corporate earnings reports increased worries over the domestic economy. Remember: there is no such thing as an obvious or easy trade. Today’s China news is likely hurting a lot of nascent copper longs. Crude oil speculation is a symptom of monetary accommodation. “The steepest market plunges on record (e.g. those following the 1973-74, 1987, 2000 and 2007 peaks, among others) have generally followed an overvalued speculative blowoff coupled with divergent interest rate pressures. This is why we take the "overvalued, overbought, overbullish, rising yields" syndrome so seriously. Indeed, the outcomes are usually negative on average even without rising yields, but the yield pressures tend to add immediacy. Notably, the emergence of this syndrome has provided accurate warning of oncoming losses both historically, and also as recently as 2010 and 2011. You might remember last year, when commodity prices were rising, Ben Bernanke referred to the pressure of rising prices as being transitory ... and refused to recognize it as plain and simple inflation. The financial media gave him plenty of well-deserved flak for that view. But so what? Here we are again with crude oil (and its derivatives) on the verge of applying major pressure to economic growth. I was asked two weeks ago to share some comments with an online news publisher regarding the United States’ energy policy. Specifically, 1) will the President’s newly proposed task force effectively stem price pressure brought on by speculation, and 2) does the current US energy policy influence crude oil speculation? The public tends to think government officials need to do something in order to fulfill their duties. History suggests task forces like this amount to basically a PR campaign and don’t have an actual impact on stemming speculation. Speculation is typically an effective form of price discovery; speculation alone is not a guilty party but rather a scapegoat to explain away uncomfortably high prices. Speculation and rising prices are mere symptoms of excess liquidity (loose monetary policy). What the task force needs to address is this root cause of the symptoms, not the symptoms themselves. Sadly, as past experience tells me, I doubt that will be the case. I don’t think the task force will have any effect on prices. It’s clear that speculators consider all these [energy policy problems], but there are more immediate influences [on the price of crude oil] ... especially now. First, monetary policy has created a system of endless credit and artificially low interest rates that push investors further out the risk curve. In other words, excess liquidity incentivizes speculation in inherently risky assets like crude oil. Second, geopolitical risk premium is a major concern that has the potential to dramatically influence crude oil’s underlying fundamentals, at least in the short-run. Even though plenty can be done to mitigate the risks from an inconsistent US foreign policy, there is no quick fix and investors realize how quickly Middle East tension can escalate ... and how sharply prices could react. But as it pertains to domestic energy policy, investors and speculators certainly use US policy as a foundation for crude oil price direction. Unfortunately, though, I’d say the piecemeal energy policy of the US is actually supportive of higher prices. The pushback on pipeline development and offshore drilling projects suppresses production. And that exacerbates the pressure on refineries responsible for the high-priced gasoline that consumers are so stressed about. Even though crude oil production is increasing because of shale and improved drilling technologies, it’s not increasing at a rate it could, and input costs remain too restrictive for regional refineries that are bogged down by overregulation and inefficient national infrastructure. And if you really wanted to dig in, you’d see how policy is forcing the economy to adopt still-unfeasible alternative energy development at the expense of crude oil development. When the government tries to pick winners they almost always lose. Although, if you have the central bank on your side, who needs government subsidies? I found this blog post quite informative since it sort of offers additional angles to the speculation concept that aren’t often discussed. The “inflation-hedge” idea is also very much a symptom of the excess liquidity dynamic of easy monetary policy. As for the “intermediaries” (investment banks), after digging through the nitty-gritty and interconnectedness of our fractional reserve and shadow banking system, that angle could also be considered a bit of a symptom; though it may actually be a place where a task force could make some notable progress; but again, I doubt that’s going to happen because the US corporatocracy reigns. The Federal Reserve is directly responsible, via their money creation policy, for the rising price of crude oil et al. The Fed isn’t solely responsible, but just as there can be geopolitical risk premium in the price of crude oil, so can there be quantitative easing premium in the price. And there is. But you’ll never hear the Fed Chairmen be so blunt about that because even Joe Six-pack would demand the Fed head on a platter. Instead, we get more comments from him this morning hinting of more quantitative easing? Moreover, we cannot yet be sure that the recent pace of improvement in the labor market will be sustained. Notably, an examination of recent deviations from Okun's law suggests that the recent decline in the unemployment rate may reflect, at least in part, a reversal of the unusually large layoffs that occurred during late 2008 and over 2009. To the extent that this reversal has been completed, further significant improvements in the unemployment rate will likely require a more-rapid expansion of production and demand from consumers and businesses, a process that can be supported by continued accommodative policies. The European Central Bank won’t provide more long-term loans until it has studied how the funds are distributed into the economy, council member Joerg Asmussen told newspaper Helsingin Sanomat. “We need to see how this liquidity feeds through over the next few months,” Asmussen said, according to a transcript of an interview with the Finnish newspaper on March 24 and published today. I think many market watchers will agree that the LTRO initiatives helped to stabilize markets in Europe. Of course, this has been the Federal Reserve’s stated goal as well since quantitative easing has now been determined to have little impact (if any) on the real economy. And doesn’t this stabilization in markets lead to rising prices of risk assets, like crude oil? In Europe, the German Ifo think tank's business climate index rose to 109.8, beating expectations of a steady reading of 109.6 and surprising many traders who were bracing for a soft number after last week's weak reading of flash purchasing managers' indices (PMIs) across the euro zone. Last week I proposed US consumer confidence as the true driver of economic expectations (rather than the recently improved US payrolls numbers.) The story looks a bit different in Europe, as PMI numbers are reflecting an economic slump but sentiment numbers remain firm. With German business sentiment seemingly following the markets rather than the economy, could the markets be lagging the economy in Europe? The US economy has “improved” in the face of rising energy prices, but the eurozone economy has deteriorated. What happens if crude prices go higher due to the monetary accommodation? Can either economy afford the generosity of their central bank, much less all the speculation from traders, inflation-hedgers and investment banks who are certainly taking notes? Are stars aligning for a big break in commodities? “According to analysts at Credit Suisse, the consensus has "severely" underestimated the amount of housing supply set to hit the market in coming years. Chinese developers own enough land to build almost 100,000,000 new housing units. Together with the sale of some empty apartments, this would be enough to satisfy China's housing demand for up to 20 years, the analysts have warned." I woke up this morning and checked my charts, as always. I have been expecting a downturn in risk appetite to manifest in crumbling asset prices, at least until correction happened. I’ve been getting a bit discouraged with this call, as most everything has stayed relatively buoyant. But today after looking at the commodities I think we could be getting very close to a substantial and playable drop, technically speaking. The euro zone's economy took an unexpected turn for the worse in March, hit by a sharp fall in French and German factory activity that even the most pessimistic economists failed to predict, business surveys showed on Thursday. The purchasing managers indexes (PMIs), which capture how thousands of companies have fared over the month, effectively quashed any lingering hopes the euro zone might avoid falling into a new recession. Most worryingly, the surveys suggested business activity in economic heavyweights France and Germany is starting to flag, with job losses mounting across the bloc at the fastest pace since March 2010. Markit's Eurozone Composite PMI fell to 48.7 in March from 49.3 in February, slipping further below the 50 mark that separates growth from contraction and capping the first quarter of the year in disappointing style. The “resolution” that secured Greece’s second bailout brought more calm to the market than I expected ... up to, during and after the process. Thus, it seemed it would take a noticeable downturn in growth numbers to change the sentiment ... since all the PR measures will certainly fall short of actually stopping recession. The HSBC flash purchasing managers index, the earliest indicator of China's industrial activity, fell back to 48.1 from February's four-month high of 49.6. New orders sank to a four-month low, an expected rebound in export orders failed to emerge and new hiring slumped to a two-year low. Clearly, China has been on a steady and gradual downward growth trajectory. But thanks to eurozone commotion and a gravity-defying US stock market, the slower growth in China has not been met with much scrutiny. This theme of the eurozone falling into recession followed by lower-than-expected Chinese growth has been part of our fundamental story for some time now. And for those who follow me more closely, and those who subscribe to my Commodities Essential newsletter, know, I expect this dynamic will ultimately hit commodities hard. Another take away is the improving US growth differential. With investors of an increasingly international mindset, investing has become very much a relative game at times (note: it’s always a relative game in the FX market.) That said, we could continue to see a relative outperformance in US assets relative to those in Europe and Asia. US jobless claims fell to their lowest level in four years, as reported this morning, for what it’s worth. This means US stocks could continue to outpace foreign stocks on the upside. I am just waiting to find out if US stocks will ever succumb to any downside. We could be close. Rising Payrolls vs. Declining Consumer Sentiment: Who Wins? We don’t specialize in the stock market, but we spend a lot of time trying to understand why the stock market, as a whole, might rise or fall. It helps us understand capital flows across and between global financial markets. Much ink has been spilled lately about a “real” recovery in the US having arrived ... finally. Sure, some recent data suggest recovery. But is it any different from the last time the R-word was in style? There is more, like regional Fed data and manufacturing indices and retail sales. For good reason, the US stock market has outperformed its foreign peers based on the expectation that growth in the US will be relatively better than growth in other developed economies. But could recovery optimism, and US stock market gains, be derailed? A popular stat being passed around lately is the impact rising crude oil has on the economy. That is, for every $0.01 increase in the price of crude oil $1 billion is sapped from consumers. Of course, the actual impact of crude prices on economic growth can be debated. Some say the withdrawal of discretionary spending due to increased spending on gasoline still makes its way through into the economy and thus won’t necessary stunt a recovery. But even there, the overall impact may depend a lot on the pace of rising fuel prices (faster increases mean greater negative impact on consumers.) And turning to sentiment again, consumers may postpone discretionary spending based solely on uncertainty in fuel prices. Consumer sentiment turned sharply higher in the third quarter of 2011, before the payrolls began showing noteworthy increases in the first few months of 2012. So what will win? Will the added jobs prop up consumer sentiment? Or will persistently high gasoline prices weigh down on sentiment and manifest itself in the form of a drop off in payrolls? Confidence among U.S. consumers unexpectedly dropped in March as this year’s 17 percent jump in gasoline prices threatens to squeeze household budgets. The Thomson Reuters/University of Michigan preliminary index of consumer sentiment fell to 74.3, the lowest this year, from 75.3 the prior month. The gauge was projected to rise to 76, according to the median forecast of 70 economists surveyed by Bloomberg News. A government report today showed that consumer prices rose in February by the most in 10 months, with gasoline accounting for 80 percent of the increase. I would guess the powers-that-be are in full PR mode, willing to do whatever it takes to bolster consumer confidence (after all, it is an election year.) So it will be particularly interesting to see how the Federal Reserve handles QE3/low interest rates/rising prices, because shoring up sentiment is very much what monetary policy has been hinged upon. The Fed will stay loose as they monitor how the economy responds to fuel prices. But if and when economic data responds to high fuel prices and dips in consumer confidence, the Fed looseness cease to be a factor for equities, at least in the short-run.